Higson Dental Group can’t wait to meet your little ones! We encourage a “very” first visit sometime after your child’s third birthday. Our intention is to introduce your child to the practice and make them feel comfortable in our space. Although we will do a gentle examination and address any concerns you have, most of our time will be spent showing your child some of the neat things we have in the office. This will include a ride in the dentist chair, wearing super cool sunglasses and a fun little prize at the end of their visit. In some special cases, and if the age and cooperation permits, we may take x-rays to reveal any suspected decay or assess the permanent teeth under the gums. We may also clean the teeth and use some topical fluoride to help protect against decay. But mostly we will ask about your child’s oral hygiene habits and help teach them (and you!) how to clean and take care of their teeth. You know your child better than anyone. How you prep them for their visit really depends on how you want them to experience and understand this and future appointments. Our goal is that your child not only feels comfortable coming to our practice but that they actually look forward to it! Many of our young patients are upset when they come to the office with a sibling and find out they don’t have an appointment. Read books about the dentist. Tell positive and enjoyable experiences you’ve had at the dentist. Get your child acquainted with the office space. Discuss any adverse habits like finger and thumb sucking. There are many advances in dental care that can really help protect your children’s teeth. We use the latest in dental sealant technology; a restoration that bonds to the chewing surfaces and helps prevent tooth decay. 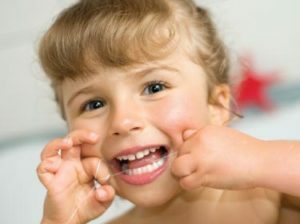 We also discuss proper brushing and flossing techniques so kids learn to make this part of their daily hygiene practice. All these things can help build a solid foundation for a lifetime of healthy teeth. One of the main reasons kids get cavities is from a high intake of sugar and a lack of brushing. Limiting sugar in their diet, and daily brushing and flossing will help prevent tooth decay. Having food in the mouth for a longer period of time can also contribute to the problem. While eating, an acid reaction occurs in their mouth as bacteria begin to digest carbohydrates. This can last approximately 20 minutes, long enough for the acid environment to invade a tooth structure and lead to cavities. Saliva also plays a role in the process. When saliva is thin it breaks up and carries food away quickly. Carbs and sugars can create thicker saliva, which moves slower and creates acid-producing bacteria that leads to cavities. Lower the frequency of meals and snacks. Routine brushing, flossing, and rinsing. Limit sugary drinks, and increase water intake. Limiting sticky foods and candy. Nutritious snacks low in carbohydrates. Baby’s teeth start to appear from around four to eight months of age. The two bottom teeth are usually the first to appear, followed by the upper four front teeth and then the remainder will appear periodically until around the child is about 2 ½ years old. At this time, your child may have 20 baby teeth, which will do all the work until the ages of five and six when the permanent teeth start erupting. With this in mind, all children are different and may experience the eruption of new teeth at varying months or ages—it’s more important that the proper sequence takes place then the age it occurs. While baby teeth exist for a short amount of time in a child’s lifespan, they have a very important function. Baby teeth hold space for permanent teeth, manage bite, and help with chewing, speech, and appearance. It’s imperative that you give these teeth care and attention and start the preventative routines of healthy diet, brushing and flossing at a very young age. Every parent considers their child’s dental health and happiness their utmost priority, and yet many parents remain unaware of the best way to approach child dentistry for optimal results. From determining the right time to bring a child to their first dentist appointment to preventing cavities at home, there is much that parents need to learn to promote their child’s good dental health at the outset. To help families get started with pediatric dentistry, we have created the following guide on common concerns parents have regarding child dentistry. A child should see a dentist for the first time once their first tooth erupts, between 6 months and 1 year of age. This allows the dentist to evaluate the child’s tooth and jaw development thus far, as well as determine the risk of cavities. It also gives new parents the opportunity to learn about proper infant and toddler dental care, the risks of thumb sucking, dental milestones, and much more. Although the general recommendation is for children to have a dental checkup every 6 months, the frequency of these visits will greatly depend upon every child’s individual needs. The goal of each checkup is to continue monitoring your child’s tooth development and gum health and to detect problems as early as possible. A small, soft-bristled brush is ideal for young children. Use a pea-sized amount of non-fluoridated toothpaste until your child can spit it out on their own (around age 3), then transfer to fluoride toothpaste. Furthermore, start teaching good oral habits early on by brushing your child’s teeth twice a day. The easiest way to prevent cavities is to ensure that your child eats a balanced diet from all 4 food groups. It is also important to control their intake of sugars and starches, including beverages – certain fruit juices, too! If you are still unsure of the right approach, ask the dentist for dietary recommendations especially for your child. As a dedicated provider of pediatric dentistry to Grand Prairie-area residents, the Higson Dental Group team looks forward to guiding parents through providing the highest quality care for their children’s teeth. Make a dental appointment for your child!